Just last week, while I was performing euthanasia for a critically ill patient, the pet’s owner looked at me and said, “I bet this is the hardest part of your job.” That gave me pause. For me, putting animals to sleep is not one of the hardest parts of being a veterinarian. That’s because euthanasia is often a blessing and gift to a suffering animal. In my experience, the hardest part of being a veterinarian is telling owners that their beloved pet has a terminal illness and will soon be leaving this world. The emotions that pass across their faces, even if they have suspected the worst for some time, are heart-wrenching. I still remember the first person I had to share this terrible news with. He was a nice, middle-aged man with two small children and an 8-year-old Rottweiler named Stone. Stone was a member of the family, and when he started to limp, his owner brought him straight in to be checked out. Stone was a wonderful dog at home, but he was not a fan of the veterinary clinic. My best dog treats did nothing to warm his heart, and when I manipulated his painful left shoulder, well… that ended our chances of being best friends. Even though Stone was not an admirer of mine, I liked him, and I really liked his owner. That made it so much harder to discuss his diagnosis: osteosarcoma. Osteosarcoma is a painful bone tumor that responds poorly to treatment. In some cases, treatments involving limb amputation and/or radiation therapy can be beneficial. In Stone’s case, these options were not feasible. Together, Stone’s owner and I decided to provide him with the best palliative care we could, and we promised each other that we would not let Stone suffer. When the time came, we would do the right — if tough — thing and put him to sleep rather than allow him to live in increasing pain. The most recent person to ask me this question was my own mother. Her Miniature Schnauzer has battled long-term health problems and was recently diagnosed with diabetes. Unfortunately, she initially responded poorly to treatment. She lost her love of food, began soiling her bed and was generally acting pitiful. Over the past few years, I’ve heard a lot of veterinarians give wonderful advice to people who are wondering when it is time to give their pets the gift of a peaceful passing. Here are four of the best pieces of advice I’ve heard, and they are the same ones I passed on to my own mother for her consideration. Every pet, illness and situation is different. 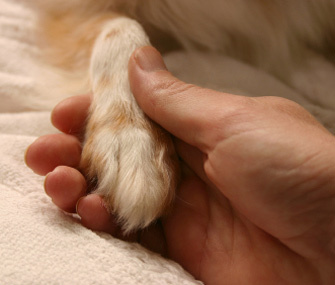 There is no single rule that can be followed for when it is time to help your best friend “cross the rainbow bridge.” Getting input from your veterinarian on the specific medical conditions that your loved one may face is vital for doing what is best for your pet. You may also benefit from having a caring friend who is not as emotionally involved in the situation as you are to help you gain perspective and really “see” what is happening with your pet.